Donut King has been serving the Donut King Cinnamon Donut for over 30 years, and is now much, much more than just a donut shop. Since opening our first store in 1981 we’ve been growing steadily. We now have over 300 stores throughout New Zealand and Australia – and we’re still growing. Our exciting new stores are available across New Zealand, find new and existing sites or we can find a site that suits you. Need more info on Donut King franchising? Donut King provides proven business models and support systems that will teach you everything you need to know! 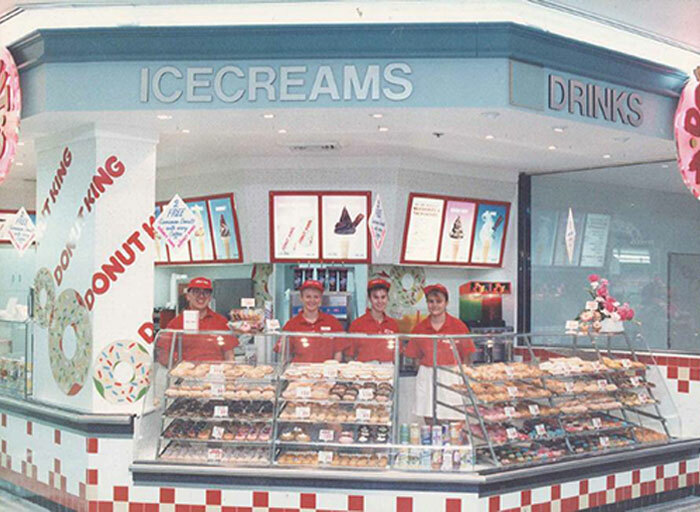 It is amazing to look back at photos of the first Donut King store, which opened in Sydney in 1981 and to appreciate the progression from a rudimentary franchise system to a franchise system with over 300 stores throughout New Zealand and Australia, the vast majority of which are owned and operated by franchisees. The sweet simplicity of producing our donuts means that franchise owners are able to focus on their customers and growing their business. Today Donut King offers its customers both young and young at heart a range of mouth-watering donuts (cake and yeast), espresso coffee, hot and cold beverages, signature Megashakes, soft serve ice cream, breakfast toast and hot dogs – not to mention hot cinnamon donuts cooked to order. As a business package, Donut King provides all support systems, marketing, operations manuals and training along with ongoing field advice and coaching to assist our franchise owners. Donut King is truly an icon in the retail food market, attracting customers from all ages and walks of life and delighting them with a fun experience and delicious treats and beverages. For most Kiwis, at least once in our lives, we have taken a trip to Donut King for a delicious treat. The Donut King store stood out in the food court, like a giant pink beacon, the brightly coloured iced donuts, the squishy, creamy delights of the cream and jam donuts, experiencing the magic of the warm cinnamon donuts being created, bouncing along that mini conveyor belt and landing in a delicious carousel of cinnamon and sugar, to be eaten fresh and hot. We’ve all been there and have grown up sharing this experience, it’s a place for the young and the young at heart. Since the beginning, almost 3 decades ago, we’d like to think that Donut King has grown up. Tastes change over time and our tastes have changed too. We still love the old favourites, but we’ve also introduced some changes for the better. Your local Donut King now stocks a wider range of snack options, including smoothies and milkshakes. You’ll also find Fruit Freezes and some of the best tasting coffees around. If you’re looking for something more substantial, you can’t go past our range of hot dogs or our new additions to the menu, our Warm Mini Jam Balls and Churros, fresh out of our donut making robot! Donut King is all about fun and life’s little rewards. It’s this philosophy that brings our customers back time after time. Our snack-tastic cake donuts are made with a cake mixture and topped in a range of delicious fondants. Then we finish the job with an array of sprinkles,100s and 1000s and even a chocolate or novelty topper! It’s small in size, but great for that cheeky little indulgent treat. Our classic yeast donuts come in a range of shapes and are an absolute winner. They are also decorated with our very own Donut King fondant, sprinkles and novelties. Our tasty hot dog range starts with our classic Regular Dog through to Hot Dogs with delicious extras, like caramelised onion, tasty bacon and shredded cheese. Take your taste buds back in time with our traditional mouth watering soft serves, available in a classic, crunchy cone or a sundae with a burst of flavour. The perfect way to chill out! For our coffee loving customers, Royal Bean is a unique combination of beans sourced from international locations and roasted to perfection to make Royal Bean a rich, smooth and desirable cup of coffee. Fruit Freeze is available in fruiti-licious flavours – Mango, Strawberry and more for everyone to enjoy. Our Store Models – Which suits me best? Donut King store are generally available in busy shopping centres and airports. Our small store and kiosk store layouts are predominantly takeaway experiences, while our large store design include a small dine-in seating area. A broad range of products, services and training programs. People from all walks of life can become successful Donut King franchisees. No prior baking or coffee knowledge is required. A comprehensive preliminary training program is provided for all new owners covering theoretical and practical aspects of coffee making, customer service and operational facets. We provide onsite assistance at opening or takeover stage. Our franchisees have access to comprehensive online training programs, Inspire and RIOT, to help train their team. In-store training is delivered on a needs basis by our dedicated Business Development Managers and Barista Trainers at no additional cost. The Donut King operations team are there to help you, with a dedicated Business Development Manager who will help you set daily targets to help you achieve your goals, assist you with any training you and your staff require to help you get the most out of your business. Donut King’s Marketing Department is a team of qualified professionals with years of experience creating and implementing innovative and successful marketing programs. The marketing team are responsible for all major national campaigns, digital and social media, promotions and point of sale materials as well as helping you with local store specific marketing – all activities having the primary focus of driving customers into your store, increasing store sales and enhancing the Donut King experience for every customer. The experienced Donut King procurement team have a proven track record of managing key supply chains within the food industry. Their focus is on buying suppliers to deliver quality, supply chain integrity, innovation and value. They utilise the strength across all of our brands to manage this process. All of this means greater savings, efficiencies and service for our franchisees. The investment range for new stores is generally $280,000 – $380,000 plus GST, including the initial franchise fee. The investment level varies depending on the size of the site, equipment required and the landlord conditions or contributions. The selling price of existing stores is set by the current franchisee, and will vary as does the price of any existing business for sale. Many factors will determine the cost of converting an existing business to the Donut King franchise system and as such no price range can be offered in this booklet. Please contact Craig Watson craigwatson@donutking.co.nz or phone +61418360392 for more information on converting your existing café to the Donut King franchise system. The price of an international Master Franchise Licence will depend on the size and market potential of the country or region being purchased. Please contact Retail Food Group for more information on international master licences. The price of an international Master Franchise Licence will depend on the size and market potential of the country or region being purchased. Please contact us for more information on international master licences. Once you’ve decided on selecting a Donut King franchise, we are there to support you every step of the way through the application process. STEP 1. You make your initial enquiry and are introduced to the Franchise Recruitment Executive who will discuss your needs and work towards finding a suitable site that meets your requirements. STEP 2. A phone interview is conducted with your Franchise Recruitment Executive. STEP 3. You may wish to consult independent legal and financial specialists for additional advice. We also encourage you to visit existing stores and meet with existing franchisees. STEP 4. You will be provided with a Franchisee Application for completion. A site specific budget estimate is offered. Having received this information, you are now able to consider finance options. Donut King NZ will then assess your application keeping in touch with you along the way. STEP 5. You will be invited to take part in a formal operational interview with an Donut King rep. This report will be added to your application for approval. STEP 6. If your suitability is confirmed, we request further information on your financial position and ability to open and operate your franchise. A refundable deposit is required on return of this information. STEP 7. The Donut King Legal Department will inform you whether your application has been approved or declined, and if approved, a conditional franchise approval letter will be sent to you. After you have obtained legal advice, the conditional franchise approval should be signed and returned to Donut King. Once this is received, Donut King will confirm your training intake. STEP 8. You must now have confirmed that you have obtained finance approval, ensuring that the finance allows for the making of progress payments. Donut King now provides you with the formal franchise grant documentation. We request that you seek mandatory independent legal advice (it is also recommended that you seek financial and business advice at this time). STEP 9. You execute and return the franchise grant documentation with all of the requested deposits or progress payments. Dependent upon the country a cooling off period may prevail. STEP 10. The shop fitter’s contract is completed and progress payments continue. STEP 11. You now make payment of any balances remaining. STEP 12. Your Donut King outlet opens! STEP 16. Donut King provide you with ongoing support in aspects of your business including administration, financial management, local marketing, coffee, retail operations and customer service. You will receive regular visits from your local Business Development Manager, as well as being provided with newsletters and other communication pieces. You are now part of the network of Donut King franchisees and have access to regular franchise group meetings where you can share ideas, discuss problems and participate in the ongoing development of the Donut King franchise system. Established Donut King outlets are advertised for sale on the Donut King website, as well as through independent business brokers and various franchising websites. STEP 1. You make your initial enquiry to either the current store owner or a business broker. STEP 2. Once you are in a position to progress the sale with the store owner, Donut King will provide an application form to you for completion and return. STEP 4. Donut King will assess your application, keeping in touch with you along the way to ensure all necessary information is provided to both yourself and to Donut King. STEP 5. You will be invited to take part in a formal operational interview with an Donut King rep. This report will be added to your application for approval. Your communication continues with the broker or franchisee and Donut King regarding the process of your approval. Any finance you are obtaining to complete the purchase must be confirmed and sent to us. STEP 6. The Donut King Legal Department will inform you whether your application has been approved or declined, and if approved, a conditional franchise approval letter will be sent to you. After you have obtained legal advice, the conditional franchise approval should be signed and returned to Donut King. Once this is received, Donut King will confirm your training intake dates. STEP 7. Donut King now provides you with the formal franchise grant documentation. We request that you seek mandatory independent legal advice (it is also recommended that you seek financial and business advice at this time). STEP 8. You execute and return the franchise grant documentation. Dependent on the country a cooling off period may prevail between (Step 3) and returning the executed franchise grant documentation. STEP 9. Your solicitor and Donut King legal counsel arrange settlement. You and the outgoing franchisee conduct a stock take the night before settlement – the BDM is available to be present at stock take if required. STEP 10. You start trading in your Donut King outlet! STEP 11. Donut King provides you with ongoing support in aspects of your business including administration, financial management, local marketing, coffee, retail operations and customer service. You will receive regular visits from your local Business Development Manager, as well as being provided with newsletters and other communication pieces. You are now part of the network of Donut King franchisees and have access to regular franchise group meetings and conferences, where you can share ideas, discuss problems and participate in the ongoing development of the Donut King franchise system. Becoming a franchisee with a multi-brand franchisor offers many significant benefits to existing business owners. Please contact Craig Watson on craigwatson@donutking.co.nz or call +61418360392 to discuss whether your existing café would be suitable for conversion to the Donut King franchise system. Do I require any special experience? No, although having business experience is always an advantage. We provide comprehensive training for all areas of your new store, plus extensive Coffee (Barista) training. What is the term of a franchise agreement? New franchisees are ordinarily granted a five (5) year initial franchise term together with an option to renew for a further five (5) years. This may vary depending upon the term of the lease applicable to the site. What is the total cost of acquiring and opening a Donut King franchise? A new store can range in price from $280,000 to $380,000 + GST. What does the total cost include? It includes a fully fitted-out store and equipment, training, manuals and initial franchise fee but excludes a bank guarantee, working capital and GST. Do I have to pay a deposit? If so, when and under what circumstances would I lose my deposit or any part of it ? A $3,300 deposit is payable upon application. These monies, less the franchisor’s reasonable expenses (to a maximum of $300), are refundable if the application is not approved. What are the ongoing fees of the franchise? A franchise service fee of 7% (plus GST) of your total gross sales is payable in connection with the Donut King franchise system. A marketing contribution equal to 3% (plus GST) of your total gross sales is also payable into an independently audited marketing fund. This fund is used to collectively promote increased customer awareness and provide each store with promotional material and ongoing marketing services to facilitate constant attraction of new customers, increased average dollar sales and the frequency of purchase. This depends largely on several factors such as the value of wages paid, cost of goods and other operating costs and generally how you operate your business. We have identified certain key performance indicators which are monitored in order to maximise your profitability. Donut King will select the site and secure the lease. Ultimately, however, you must satisfy yourself as to the suitability of the premises. What initial franchise fees are payable? The Franchisor’s Disclosure Document provides full details of all fees and costs in connection with the establishment of a Donut King franchise. Do I need any other money to start? It is recommended that you have money available to be used as working capital and as a minimum we would expect you to have $16,500. For example, this will cover costs such as accounting and legal fees, business and public liability insurance and your first day’s trading stock and packaging. For a more precise list of costs associated with the acquisition of the franchise, refer to the Franchisor’s Disclosure Document. What services are included in return for the franchise and marketing fees? A Business Development Manager (BDM) to assist franchisees with all aspects of daily operations to ensure appropriate performance levels and quality standards. Have you got any sites ready to go? Yes. Refer to the Franchises Available section of our website for the complete state based listing of new and resale sites available. Are Franchisees expected to actively work in store? Yes. Franchisees are expected to work in store. This is an important factor in the success of our stores. Why should I purchase a Donut King franchise? Donut King has been serving the Donut King Cinnamon Donut for over 30 years, and today Donut King is much, much more than simply just a donut shop. Generations have grown up sharing the Donut King experience; it’s a fun place for the young and the young at heart. Donut King franchisees have the opportunity to become a successful business owner. Contact Donut King to discuss suitable sites in your area on +61418360392, or email craigwatson@donutking.co.nz with your contact details and one of our state based Franchise Recruitment Executives will make contact with you. Review all information obtained during the meeting and make a decision on your preferred store/site. Request an application form and disclosure document. Complete the application and post to Donut King once completed. Confirm your purchasing ability with your bank and with your accountant. © 2016 Donut King New Zealand. All Rights Reserved.